My friend Erin over at $5 Dinners just launched a super exciting new feature on her site today! 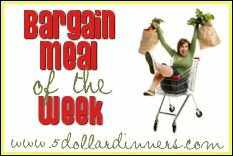 She is now hosting Bargain Meal of the Week which will feature recipes (by store) using the items that are on sale each week! My friend Susan at Everything Mom will be providing meal ideas for Kroger, Giant Eagle and Meijer which is also very exciting! One of my favorite frugal bloggers Jennifer at Getting Ahead will also be writing meal ideas for Giant Eagle sale items. You can read match ups for Kroger, Giant Eagle, and Meijer here at Stretching a Buck (or your other favorite blogs) and then head over to $5 Dinners to find some menu plan inspiration. You can read all about the launch of Bargain Meal of the Week here.